It’s easy to forget Nicole Turner is just 14 years of age. Turner in action in the pool tonight. TWO FINALS IN successive nights is a considerable feat in itself but Nicole Turner wants to learn from the experience and use it to achieve what she set out to do at this Paralympic Games. The 14-year-old finished seventh in the S6 50m freestyle medal race in Rio tonight but another strong swim leaves grounds for optimism heading into the second week of the meet. Turner, who finished fifth in the 50m butterfly last night, looked strong in lane one but tired in the second half of the race to clock a time of 36.31. “This morning was good and I felt I had more in the tank but tonight I was feeling a bit out, but I was happy with my result,” she said. With her parents and brother cheering on from the upper tier overlooking the finish line, it was another learning curve for the teenager who is embracing, and savouring, every single moment. 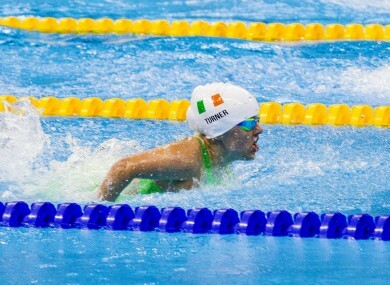 Turner can recharge the batteries tomorrow before turning her attention to the 200m individual medley event on Monday. Judging by her first two finals, coming away from Rio with a medal is not beyond the realms of possibility; although it is easy to forget she’s only 14. She’s due back in Colaiste Iosagain in Carlingford to start second year when this adventure comes to an end. What a story it would be if she could go home with a medal around her neck. Email “'My family is more nervous than me, my mum didn't sleep last night' ”. Feedback on “'My family is more nervous than me, my mum didn't sleep last night' ”.